The i360 tourist attraction tower comprises a steel tube 3900mm external diameter and 158m tall measured from the top of the concrete foundation. 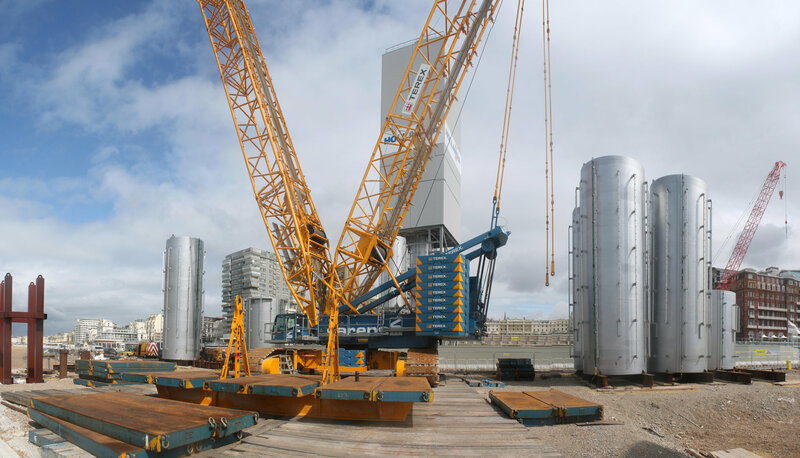 The tower consist of 17 cans which vary in height (up to 12m) and which are manufactured in the Netherlands, transported by barge to Brighton- beach and assembled at site. The 17 cans are off loaded and the cans are assembled at site in vertical direction in/using the Jacking Tower. The Can numbering started at the bottom, Can 1. The wall thickness of the Cans varies from 85mm for Can 1 to 20mm for Can 17. The last can has been installed by August 23tr 2015. PT-Structural provides the analysis for the Flange Connections of the Cans, all the temporary structures, as the Jacking Tower, the Collar, the Skidding Frame, and the sea fastening for the 2 main transports to Brighton.